While there's little doubt that global warming is set to wreak considerable havoc on the planet's ecosystems, it's not all bad news for some species of this good Earth. Given just how adaptable some animals can be, climate change is set to create entirely new opportunities for a lucky few. So get ready for an Earth inundated by tropical diseases, mosquitoes, plants, jellyfish, and snakes. To help us get a better sense of this issue, we spoke to Ramez Naam, an expert on the impacts of climate change and the author of the upcoming book, The Infinite Resource: The Power of Ideas on a Finite Planet. As we found out from Naam, there are a host of factors to consider. But that said, a picture is starting to emerge about which species are set to become the winners of climate change. As serious as climate change is, it is happening at a slower time scale than other ecologically unfriendly trends, including the destruction of habitats through land use, pollution (such as nitrogen deposition), the proliferation of invasive species, and of course, the biological consequences of increased levels of CO2 in the atmosphere. Indeed, as Naam told io9, "It's important to understand that global warming, while a significant threat to life, isn't the largest driver of extinction or forced adaptation for life on Earth." Consequently it's these short-to-medium term, human-caused disruptions to natural habitats that will have the most significant impact on biodiversity. But looking 50 years into the future and beyond, it's clear that, along with these factors, the effects of climate change are very likely to take a prominent role. Perhaps the most significant impact of climate change on wildlife will be the shifts in geographical range, what will be influenced by changes to a region's normal temperature and humidity. Models indicate that for each 1°C increase in temperature an ecological zone will advance by 160 km (100 miles). So, if the climate warms by 4°C over the next century, species in the Northern Hemisphere may have to migrate northward by some 500 km (310 miles) or 500 meters (1,640 feet) higher in altitude to find a suitable ecological niche. Accompanying this will be increased (and altered) levels of humidity, moisture, and rainfall. As a consequence, some regions, like the Mediterranean basin, will experience a drop in soil moisture — what will increase the likelihood of drought. The ability of a species to respond and adapt to climate change will depend on their ability to colonize new territory, or to modify their physiology and seasonal behavior to adapt to the new conditions (e.g. flowering or mating). Moreover, they'll have to adapt to the downstream effects of this process — including the introduction of new competitors and prey (not to mention changing geochemical conditions). "The species that are most threatened are those that are least able to adapt," says Naam. "Species that are stuck in one place, and species that have long lifecycles (and thus can't evolve very rapidly) are the ones in the most trouble." So given these conditions, it's a good bet that insects will quickly find a way to adapt. They're cold blooded and extremely vulnerable to chilly temperatures. "The colder it gets, the more of them die off each winter," Naam told us. "And the longer the cold season is, the less time the insects spend active, and the less time they have to reproduce." Put another way, as the planet warms, insect species can spread into more areas and stay more active during the year. They will thus reproduce more rapidly and grow their numbers exponentially. Naam points us to the example of the Mountain Pine Beetle. "It's threatening forests across the west," he says. "A large part of that is that warmer temperatures, particularly at night and winter, have been really good for the pine beetle. The active season for them in Colorado has doubled in length from a decade ago — and it's now long enough that pine beetles can go through two generations (about 60 offspring each) in a single year, when it used to be only one." And those warmer temperatures, he says, have also allowed pine beetles to move to higher elevation, from an old maximum of 9,000 feet, up to a new maximum elevation of around 11,000 feet. Another insect that stands to benefit from climate change is the mosquito — what is definitely not good news for us humans. Asian Tiger Mosquitoes in particular are seeing their range spread as the Earth warms. "They used to never be seen in Europe or in the northern United States — but now they are," says Naam. And indeed, warmer temperatures are exactly what the mosquitoes need to thrive, what will also allow them to increasingly survive the winter chill. And troublingly, the mosquito is a carrier of deadly diseases — another type of organism that will reap the benefits of global warming. Indeed, as mosquitoes thrive, so too will diseases like West Nile, Dengue Fever, Encephalitis, and Malaria. Basically, any pathogen whose vector relies on another animal — such as tick-born illnesses — will stand to benefit if their hosts also benefit from global warming (which many will). In addition to these diseases, climate change is also set to exacerbate the proliferation of not just animal-borne diseases, but food-borne diseases (e.g. salmonella and other bacteria-related food poisoning) and water-borne diseases (e.g. gastrointestinal parasites like Cryptosporidium and Giardia) as well. There's also cholera (which spreads with increases in sea surface temperatures, sea level rise, El Niño-Southern Oscillation — and even algal blooms), anthrax (which in addition to increased temperatures will benefit from an increase in strong winds) and the Bubonic Plague (what is spread by rodents and fleas infected with the bacterium Yersinia pestis). In anything, the spread of noxious diseases is probably one of the more understated impacts of global warming. As the sub-arctic regions of northern Canada, Siberia, Alaska, and Greenland warm, those areas will open up for plants. Plants, quite obviously, are dependent on carbon dioxide — one of the main drivers of the greenhouse gas effect. But it's also integral for green-plant photosynthesis. Scientists predict that that increased levels of CO2 will subsequently result in an increase in photosynthesis rates (via CO2 fertilization), which may actually balance the effect of temperature increase. But this will only apply to regions in which plant growth is limited by the availability of water — and what will probably alter the competitive balance between species that differ in rooting depth, photosynthetic pathway (or 'woodiness'), as well as the subterranean organisms associated with them. At the same time, the increase of anthropogenic atmospheric nitrogen will impact on nitrogen-limited regions (temperate and boreal forests, and alpine and Arctic regions). As a result, any plant with a high maximum growth rate will absolutely thrive. And needless to say, certain plants will be more productive as deeply frozen winters give way to more cycles of freezing and thawing — what increases microbial activity and breaks up the soil. "We know plants will eventually grow in areas that are now permafrost, but plant spread is relatively slow," says Naam. "And there are questions about what the soils that permafrost leaves behind will look like. That said, eventually, it's likely that plants native to the more temperate parts of Canada, for example, will migrate north, and that the animal species of the more temperate parts of Canada will follow them." But not all plants will like climate change. Early tests show that some maladaptive plants may produce shorter roots in warmer areas, and that nutrients that leach out of the soil during freezing and thawing cycles will most likely end up in rivers, streams, and lakes, where they will cause algal blooms and other problems. Consequently, changes in climate and more extreme climate events could potentially have fairly large effects on nutrient availability and the way plants grow. Some megafauna will also stand to benefit from climate change, but it's not entirely clear to what extent or which species in particular. Given that global warming is set to disrupt virtually every ecosystem on the planet, it's difficult to predict the downstream effects of so many variables. For example, ocean acidification — what's driven by increases in CO2 levels — will have an adverse impact on all calcifying organisms making it more difficult for coral and some plankton to form biogenic calcium carbonate. Subsequently, the downstream effects on oceanic food chains could be catastrophic. What is expected in the oceans, however, is that warm-water species will expand their range at the expense of cold-water species. In addition, phytoplankton cycles will be thrown completely out of whack. And as noted, gobal warming will also facilitate algal blooms, which will also cause significant disturbances to the marine web. 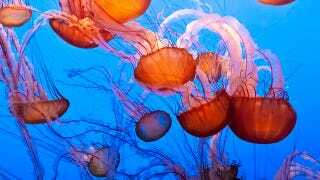 That said, it's possible that jellyfish could benefit from the changing conditions (blooms of jellyfish have already been seen in the Irish, Mediterranean and Black seas), along with some sharks (like the nurse shark). As for terrestrial animals, some scientists predict that snakes and other cold blooded reptiles will do well as warmer temperatures allow them to become more active. Moreover, their populations do well when previous years were warm. As for mammals, it's expected that the meek shall inherit the Earth — especially rodents. The yellow-bellied marmots of Colorado's Rocky Mountains area are a good example. These squirrel-like mammals can lose up to 40% of their body mass during hibernation, while longer summers give them more time to eat and store fat which helps them live through the winter and reproduce the following year. But that said, larger animals like orca whales may also benefit as it's getting increasingly easier to hunt given fewer patches of sea ice where their prey can hide. But the longer term impacts could be catastrophic; short term gain could represent long term pain for a species like this. Some birds may also benefit (again, perhaps temporarily), including the trumpeter swan (they're spreading into warmer regions) and the albatross (who are expanding territories and range on account of stronger wind currents). So given all this, get ready for a future filled with mosquitoes, tropical diseases, fast growing plants, algal blooms, snakes, and rodents. Images: Shutterstock/Mariusz S. Jurgielewicz/Bjorn Stefanson/Leslie Manning/Natural Resources Canada/Henrik Larsson/Kristina Postnikova/NMF.